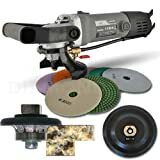 Hardin 38WVPOLSET 3/8-Inch Radius Stone and Concrete 1/4 Round Bullnose Shaping and Wet Polishing Kit was listed on Amazon for $189.00, selling for $189.00 USD brand new. Manufactured by Secco International, Inc. There are 2 units left brand new. Achieve professional results when profiling and polishing stone counter tops and surfaces with the Hardin VSP wet polisher. This is our new Hardin industrial grade variable speed wet polisher / grinder. This professional unit is equipped with a 950-Watt 8.29-Amp variable speed motor and features a variable speed dial for optimal control. You can operate from 2,000-4,000-RPM. Optimal polishing results are achieved at 2500-RPM. The Hardin VSP polishing kit is simple to use. Hook the end of the 5-Feet 1/4-Inch water line to a standard 5/8-Inch garden hose as a water source. The profile wheel works much like a router bit works. Has a flat surface that rides on top of the material being worked on. The bottom of the wheel is equipped with a guide bearing that rides up against the side of the material. This keeps the bit 100% true. Apply some force parallel to the working surface, and you’re on your way to profiling your custom edge. This Hardin VSP polishing kit with granite and marble pads is the ideal kit for this application. Start polishing with the 50-Grit pad and continue polishing with each successive-Grit until you achieve that factory shine. The pads in this kit are not general or all purpose polishing pads. They are professional grade 4 diameter X 3MM thick granite and marble pads manufactured with a softer bond resin that releases the diamonds at the proper rate for hard materials. The final pad in the kit is the 10,000-Grit buff pad. This unit is equipped with a 5-Feet 1/4-Inch water line that is positioned under the polisher. The end comes with a brass 5/8-Inchcoupling to thread onto a common garden water hose. The standardized 5/8-11 UNC spindle thread makes it compatible with most attachments on the market. Built-in GFCI protects the operator. Also included with this unit is a vacuum brazed profile wheel, bail handle, side handle, spindle wrench, and extra carbon brushes.